Most students who pursue computer science do so for one simple reason: to prepare for a career in computer science. Deciding where to apply and where to enroll are crucial decisions at the beginning of such a career. But where should you apply? How important is the decision? Many students and parents rely on computer science rankings to help them decide which schools to apply to. Some influential rankings, such as U.S. News & World Report, enter a sort of “collective consciousness” in admissions. 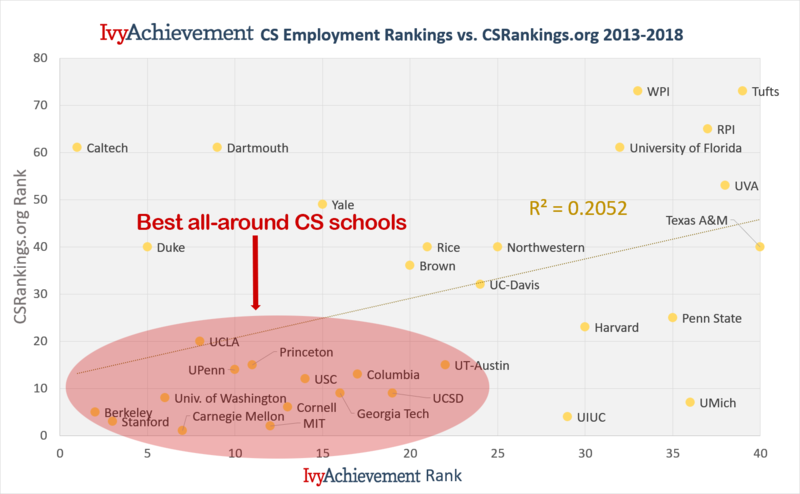 People often assume the “good schools” are at the top, and inversely, that schools ranked low can’t be “good schools.” This assumption is misguided, especially when rankings are based on factors that applicants and parents don’t care about. 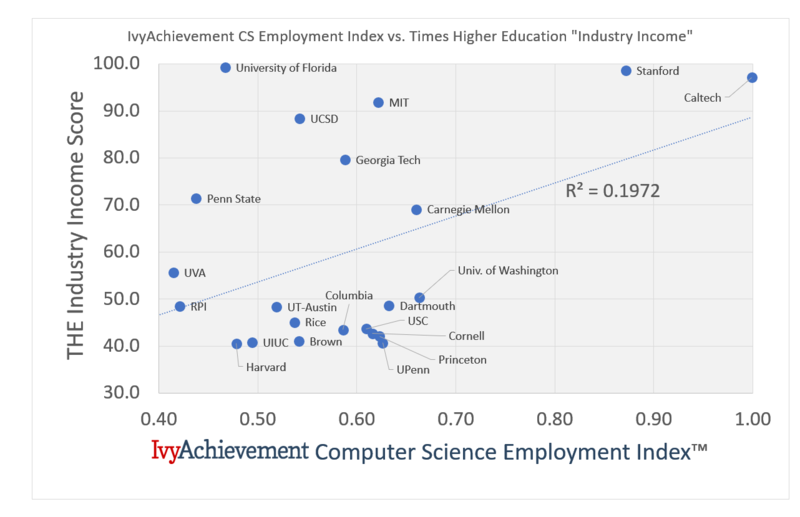 Companies that provide computer science rankings are transparent to various degrees with their methodologies, but the major rankings share one thing in common: none are based on real-world industry employment outcomes. U.S. News, for example, uses one single metric: a survey of education professionals working at universities asking them to rate the other universities. Other rankings, such as Times Higher Education computer science rankings and the QS computer science rankings, incorporate “employer reputation” metrics in addition to metrics of academic quality. In doing so, the “common sense” about which institutions are “good schools” for computer science is reinforced. Because none of the other metrics use real-world employment outcomes, misconceptions are amplified year after year. Also, none of the available rankings include liberal arts colleges for computer science. 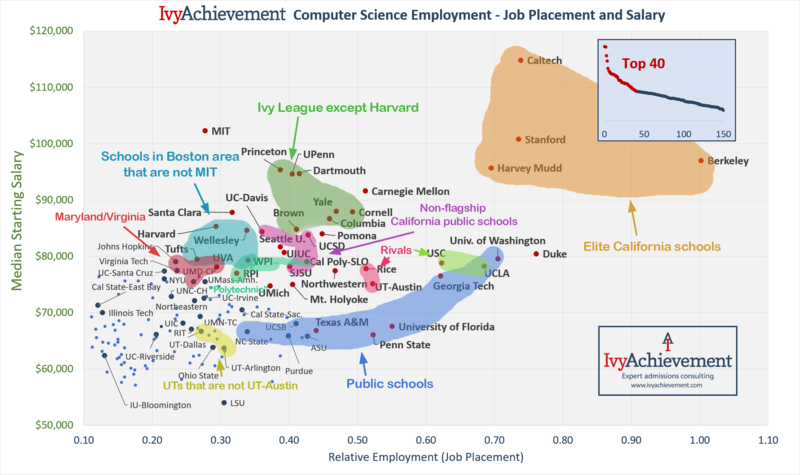 We thus endeavored to create our IvyAchievement Computer Science Rankings. Our goal was to rank schools based on data that is both relevant and reliable. Our rankings are based on two factors: placement in high-paying tech jobs and starting salaries for graduates. All schools awarding computer science degrees were eligible for our rankings, and our rankings include private research universities, public universities, online universities, and liberal arts colleges (including the best women’s colleges for computer science). Our initial ranking includes colleges and universities only in the United States, but we provide basic information on Canadian schools as well. Want to skip our analysis and just see our results? Click here to jump down! Click here to see our Canadian results. The Integrated Post-Secondary Education Data System (IPEDS) is maintained by the United States Department of Education and contains a wealth of information on undergraduate admissions, demographics, course offerings, school resources, degrees awarded, and more. We collected data on over 250 schools, starting with a set of schools that awarded at least five computer science degrees in 2016, the most recent year for which data was available. IPEDS allows users to select from hundreds of variables, including detailed statistics about computer science degrees. PayScale is a website that collects and reports salary data for various industries. Last year, PayScale partnered with U.S. News and World Report to provide starting and mid-year salary data for graduates of various majors within colleges. PayScale claims to have surveyed millions of users, we are unsure of the reliability of the data, especially for schools with small sample sizes. Still, we found the PayScale data to be sensible, and even if not a great indicator of absolute salary expectations due to self-selection bias, an excellent gauge of relative performance of graduates in the job market. 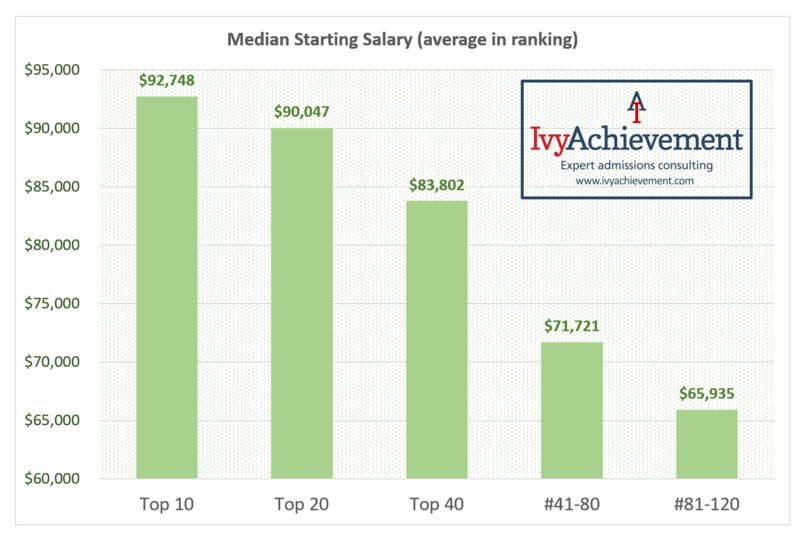 The IvyAchievement Computer Science Rankings have two components: Relative Employment and Median Starting Salary. In each case, scores were normalized with the highest given a score of 1 and the lowest a score of zero. 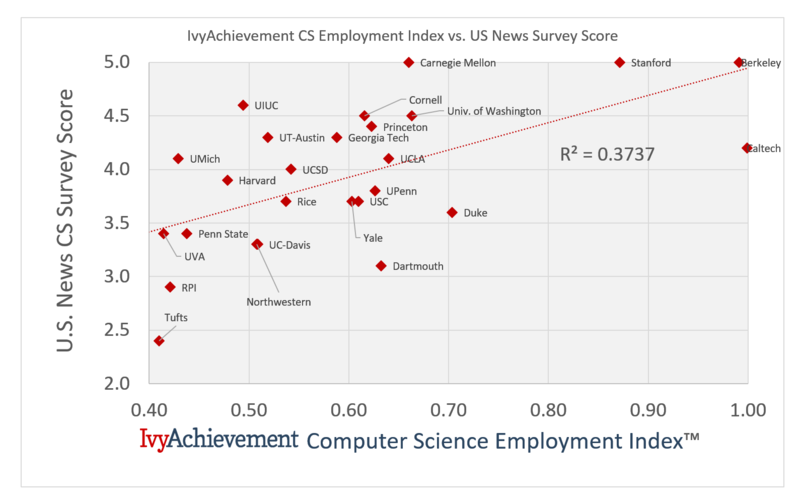 The final weighted average was then itself normalized to 1 to generate a Computer Science Employment Index™ (CSEI). Relative Employment (50%) = Number of LinkedIn users graduating 2012-2017 reporting CS-related positions in top companies divided by [the number of computer science degrees school awarded 2013-2016. Median Starting Salary (50%) = Median PayScale reported starting salary for computer science. If computer engineering data was available, we calculated a weighted average of the PayScale figures for computer science and computer engineering based on the respective number of degrees offered. These institutions, according to data provided by the U.S. government, awarded more than 1,500 computer science and computer engineering degrees from 2013 to 2016. Not all are equally represented among high-paying tech companies. The poorest showing among these came from Western Governors University, a not-for-profit online university. George Mason University in Virginia, the University of North Carolina-Charlotte, and the University of Central Florida, all non-flagship state schools, also graduate a lot of students who do not end up at top tech companies. Indiana University-Bloomington, a flagship state school, does poorly as well, especially compared to in-state rival Purdue. UT Austin outperforms UT Dallas, sending around the same number of graduates to high-paying tech jobs, but awarding fewer degrees. Stanford and the University of Washington-Seattle, schools in tech hubs (Stanford is in Silicon Valley and Seattle is home to Microsoft and Amazon), have some of the best employment prospects in terms of placement. The ratio is for reference to compare institutions; it does not represent the proportion of graduates in high-paying tech jobs, as the data is for different date ranges (degree data from 2013-2016 and employment data for 2012-2017 graduates). The search parameters also do not capture all high-paying tech jobs, but are meant to be a representative sample. The 18 schools listed here returned over 1,000 hits using our LinkedIn search parameters. If the LinkedIn results are representative, then graduates of these 18 schools alone account for about 40% of all employees at high-paying tech jobs. (66,628 total search results vs. a cumulative 26,521 search results for these 18). The University of California-Berkeley, located not far from Silicon Valley, has by far the most employees at high-paying tech jobs in proportion to the number of graduates. 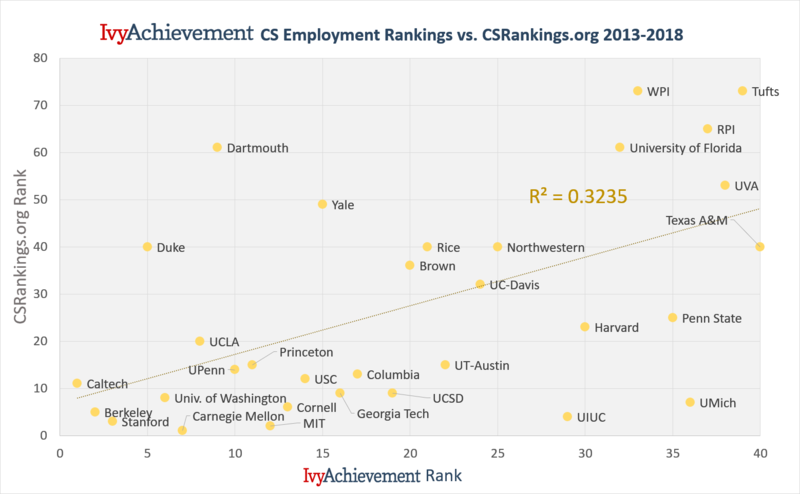 The top-ranked schools have a huge employment advantage. When we charted the CSEI against the rank, we saw a rapid drop in employment prospects through the top 40, a plateau from 40-60, and then a steady decline. Here are the top 40 schools labeled so you can see how they stack up against one another and to schools ranked below 40. The IvyAchievement CS Employment Top 40 contain a mix of types of schools. Just over half (21) are private research universities (Caltech, Stanford, Duke, Carnegie Mellon, Dartmouth, UPenn, Princeton, MIT, Cornell, USC, Yale, Columbia, Brown, Rice, Santa Clara, Northwestern, Seattle University, Harvard, WPI, RPI, and Tufts); there are also public schools (Berkeley, University of Washington, UCLA, Georgia Tech, UCSD, UT-Austin, UC-Davis, Cal Poly, UIUC, San Jose State, the University of Florida, Penn State, Michigan, UVA, and Texas A&M); co-ed liberal arts colleges (Harvey Mudd and Pomona) and women’s liberal arts colleges (Wellesley and Mount Holyoke). Caltech, Berkeley, Stanford, and Harvey Mudd, all located in California (Berkeley and Stanford in the San Francisco Bay Area; Caltech and Harvey Mudd in Los Angeles County), stand far above all others. This was visible in the linear plot above, but this plot makes the advantage even more stark. All the Ivy League schools except Harvard are in the same area on the plot. 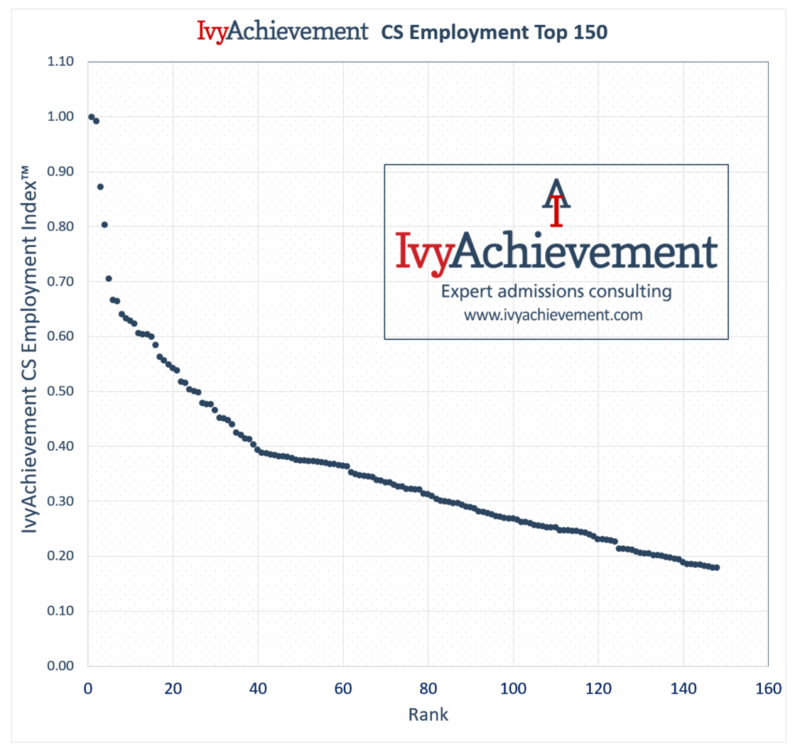 This suggests employers don’t discriminate among the Ivies. 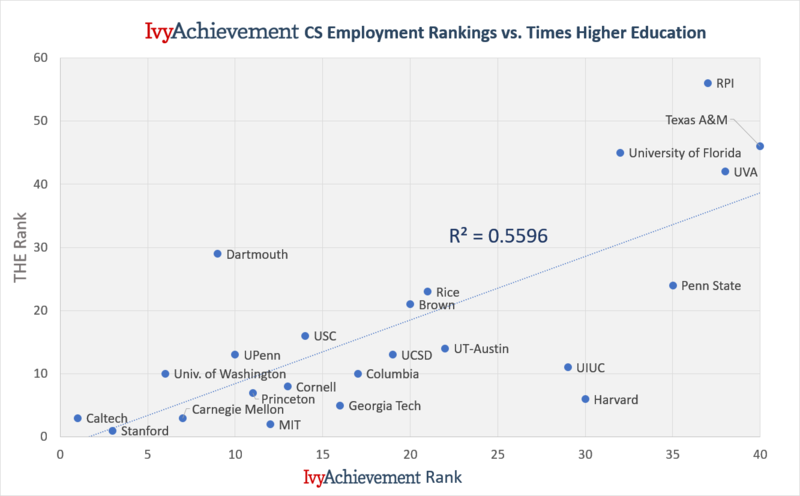 Of the Ivies, Princeton, Penn, and Dartmouth have a slight edge in salary, while Columbia, Cornell, and Yale have a slight edge in job placement. MIT graduates have high starting salaries but are not as represented at top tech companies. This is probably not because they can’t get jobs at the top companies, but because they go to smaller, less established companies. Harvard, Tufts, Wellesley, and WPI, which are all in the Boston area, are also in the same general range on both axes. Relative employment is not high, but salaries are comparable to top schools elsewhere in the country. 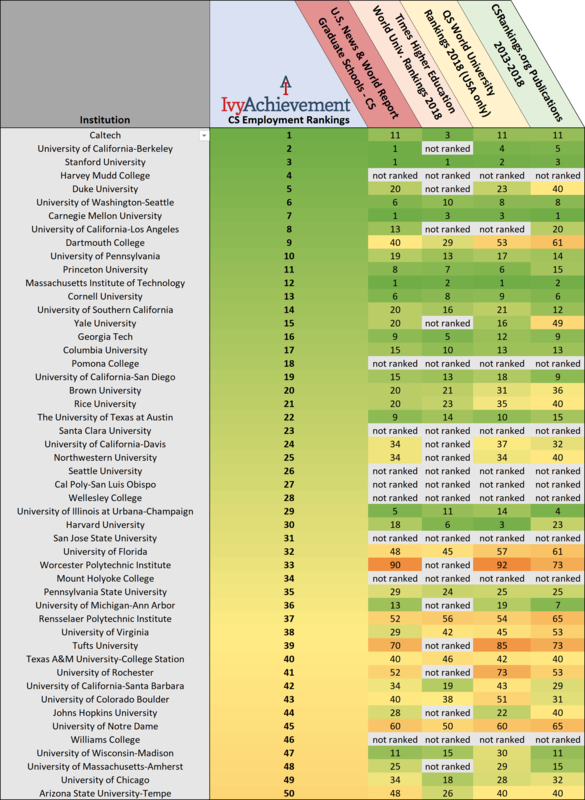 Several California public schools (UCSD, UC-Davis, Cal Poly, and SJSU) fare similarly in our computer science employment rankings. 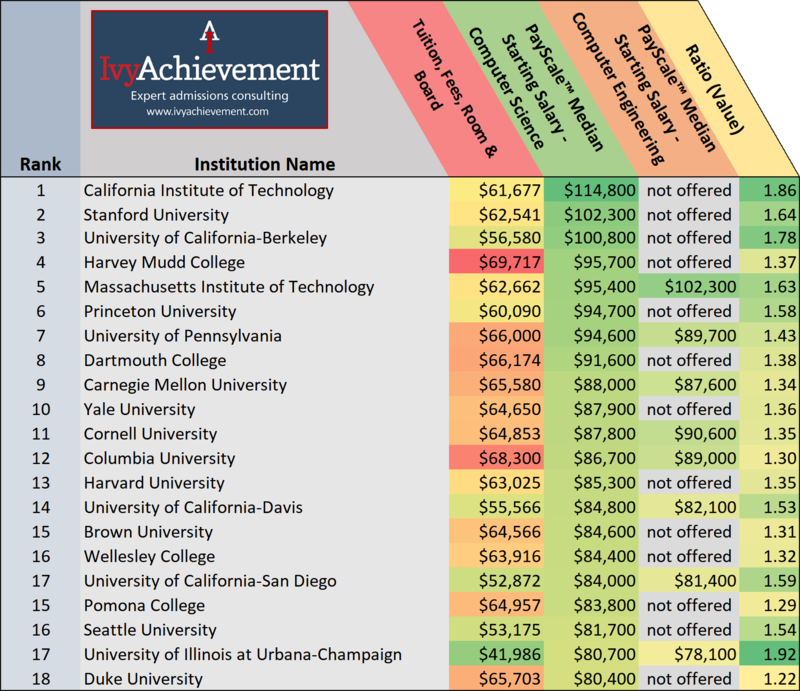 Berkeley and UCLA, usually considered the most prestigious California public schools, have a huge advantage in job placement, but only Berkeley grads enjoy an appreciable advantage in salaries. There is similar performance among graduates of Johns Hopkins, the University of Maryland-College Park, UVA, and Virginia Tech, all located in the same general geographical area. Only UVA makes our Top 40. UT-Dallas and UT-Arlington fare similarly to each other and very poorly in comparison with flagship campus UT-Austin. As noted earlier, UT-Dallas places many graduates at top tech companies, but a smaller proportion of their computer science graduates gets hired. 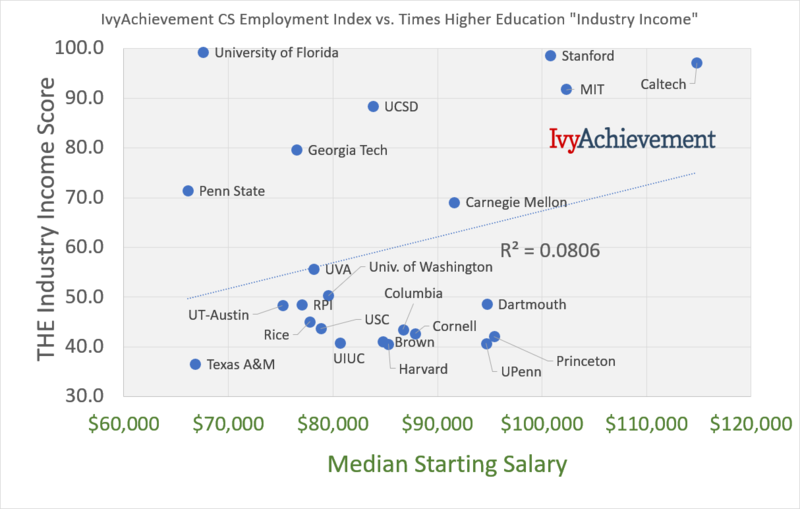 Several public schools (the University of Washington, UCLA, Georgia Tech, the University of Florida, Penn State, Texas A&M, ASU, UCSB, Purdue, and North Carolina State) have relatively weaker starting salaries relative to their job placement compared to their peers. This is likely due to graduates taking lower-paying jobs at top companies and/or geographic areas with lower salaries. Graduates among private-public rivals USC/UCLA and Rice/Texas perform nearly identically in the job market. Employment outcome need not be a factor in deciding between these rivals. Speaking of rivalries, Duke far outperforms its local rivals UNC and North Carolina State University in high-paying tech job placement. There may be a “research triangle,” but there is no “jobs triangle.” Duke is the indisputable No. 1 in North Carolina for computer science employment. Worcester Polytechnic Institute (WPI) and Renssalaer Polytechnic Institute (RPI) graduates also perform nearly identically to each other. (This does not do much to help students considering RPI vs. WPI, but may assure them that they won’t go wrong.) Coincidentally, they also perform similarly to the California Polytechnic State University. 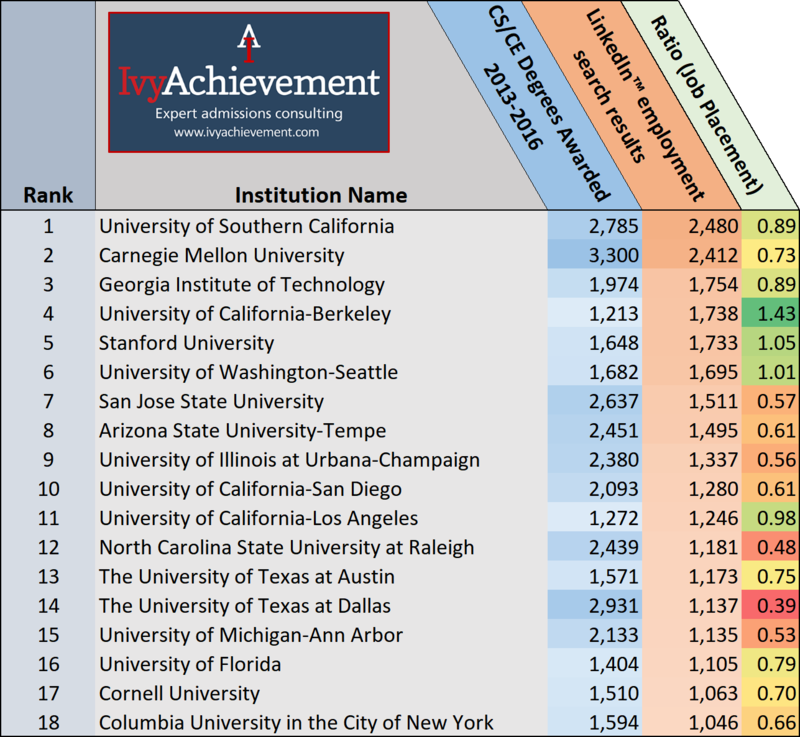 It is notable that despite completely different methodology, all but two of the IvyAchievement CS Top 40 schools are in the U.S. News top 52, if they are ranked. 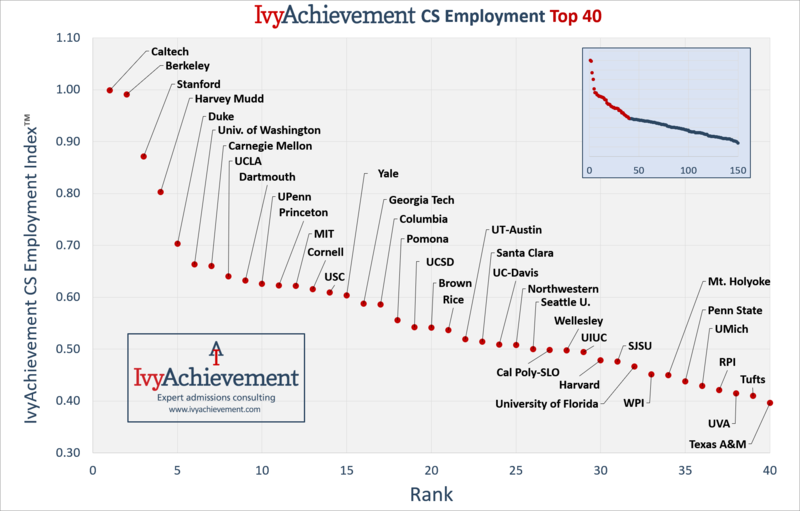 Schools in the IvyAchievement CS Employment Top 40 not ranked by U.S. News include two co-ed liberal arts colleges (Harvey Mudd and Pomona College); women’s liberal arts colleges (Wellesley and Mount Holyoke); two state universities in California (San Jose State and Cal Poly); and two private universities in major tech hubs (Santa Clara University and Seattle University). Because these schools are not ranked by U.S. News, we believe they are overlooked by aspiring computer science applicants, especially international applicants who may be less familiar with non-flagship state schools and liberal arts colleges. 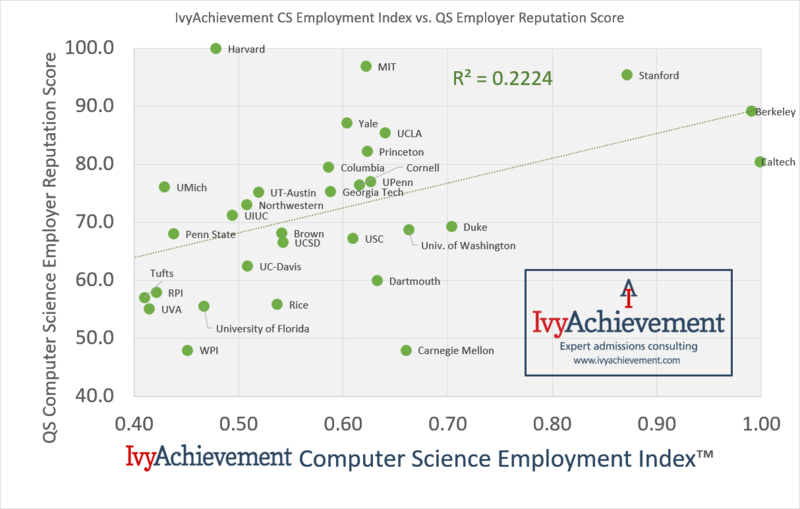 A few notable differentials between the IvyAchievement Computer Science Rankings and the U.S. News rankings were Dartmouth (#9 in our ranking vs. #40 for U.S. News); MIT (#12 vs. #1); UIUC (#29 vs. #5); Tufts (#24 vs. #70); Worcester Polytechnic Institute (#33 vs. #90); and the University of Michigan (#36 vs. #13). MIT’s relatively low ranking was a bit surprising. As seen above, it takes a hit because of its job placement statistics. Four schools appearing in the U.S. News top 34 were outside our top 60: Ohio State, UNC Chapel Hill, University of Minnesota Twin-Cities, and Rutgers. All are large state schools whose average salaries are likely lower than those in states with more tech firms. UNC Chapel Hill’s relatively poor showing (#75) is one of the most surprising results, putting it just below rival North Carolina state and well below Duke. Times Higher Education (THE) ranks 300 universities based on “13 performance indicators” including research citations, reputation, and teaching environment. For individual fields such as computer science, the “methodology has been recalibrated to suit the individual fields,” although it is unclear precisely how. 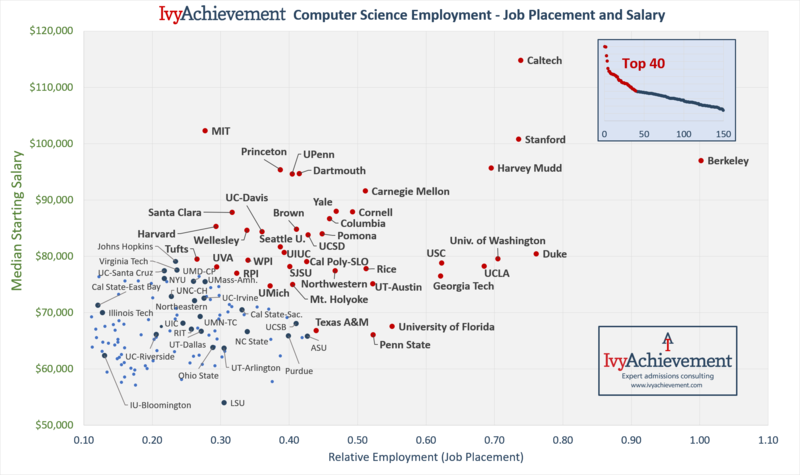 THE’s rankings are well researched and impressive in their scope, but there are some very conspicuous omissions: Times Higher Education does not rank Yale, Duke, UC-Berkeley, UCLA, Northwestern, the University of Michigan, or Johns Hopkins for computer science. These are major institutions to which most top students consider applying. 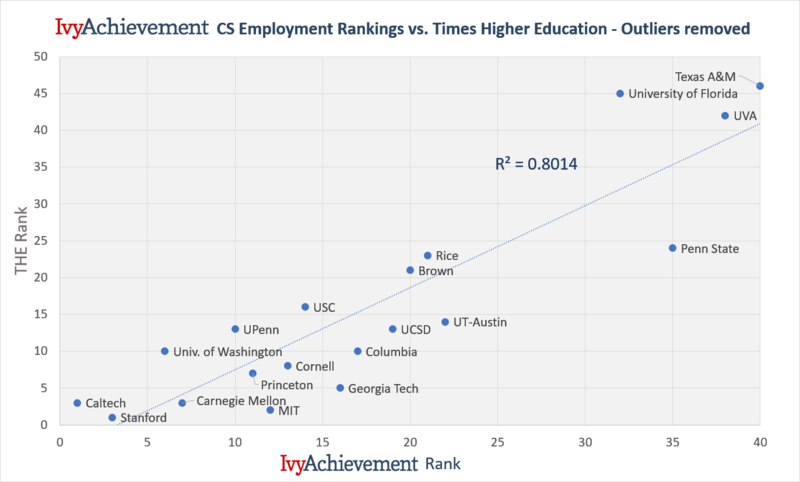 Although we laud THE for not ranking schools where sufficient data was unavailable, this makes their computer science rankings much less helpful to those choosing schools based on employment prospects. THE also does not rank liberal arts colleges, smaller research universities such as Tufts and the University of Rochester, or several public schools in California (including UC-Davis, Cal Poly, and SJSU). Twenty-four of our IvyAchievement Top 40 were ranked by Times Higher Education. Of all the rankings we examined, THE’s rankings correlated with ours the most closely. Similarly to the U.S. News results, none of our Top 40 were ranked lower than #56 in the United States by THE. Notable discrepancies with THE include Dartmouth (IvyAcheivement #9 vs. THE #29); the University of Wisconsin-Madison (#47 vs. #15); the University of Chicago (#49 vs. #18); the University of Maryland (#56 vs. #15); Purdue (#65 vs. #20); and UNC-Chapel Hill (#72 vs. #25). Thus, as with the U.S. News results, a few large state schools underperform in our rankings. Of our top 50, QS omits the same schools as U.S. News does, including liberal arts colleges and regional colleges/universities. 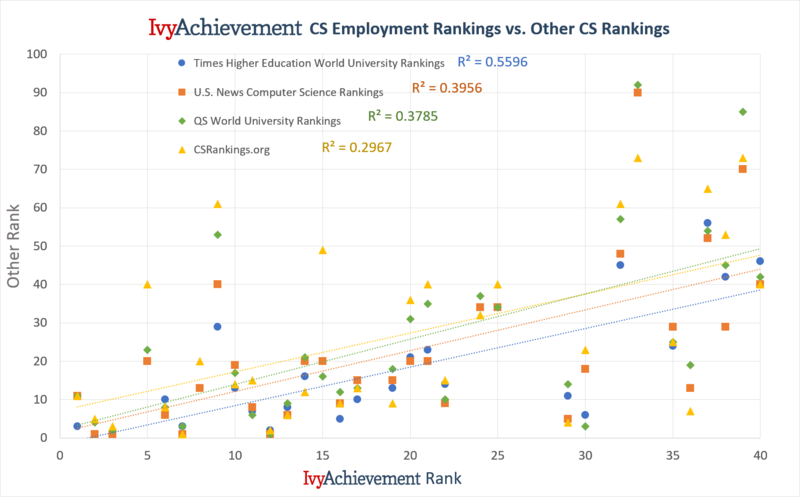 Thus, the QS rankings are of limited value to those interested in computer science education and employment outcomes. CSRankings.org is maintained by UMass-Amherst computer scientist Emery Berger. The site draws on DBLP, “on-line reference for bibliographic information on major computer science publications.” The scores and rankings generated by CSRankings.org reflect publications per institution by “faculty that have appeared at the most selective conferences.” Thus, the ranking reflects those who are employed by universities, not by tech companies. We include this ranking for comparison because students may wish to apply to and enroll in a university with strong research for intellectual curiosity or in contemplation of pursuing academia. Ideally, CSRankings.org could be used to calculate the number of publications per faculty member, but this is more difficult than it seems. 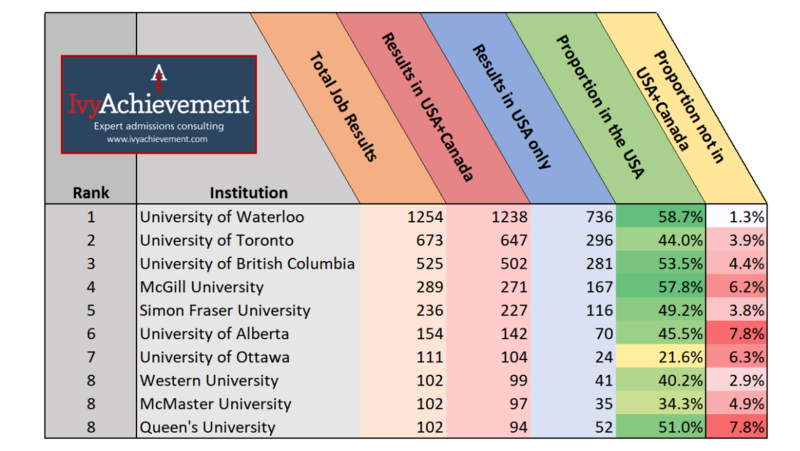 CSRankings.org reports number of faculty, but determining the relevant number is difficult, as faculty are distributed across departments, and departments are organized differently from university to university. (For example, MIT and Berkeley have departments of Electrical Engineering and Computer Science, whereas many other schools have separate departments.) Our attempts to include a computer science faculty-to-student ratio ran into these difficulties. We would have liked to include this figure in our rankings, but we were unable to come up with statistics and were consistent and fair from school to school. The schools highlighted above are the best all-around choices for computer science in the United States and will provide the best opportunities for a career in computer science, whether professionally or doing research. They are the only schools in the top 25 of both IvyAchievement Computer Science Rankings and the CSRankings.org. They are also in the top 25 of U.S. News, Times Higher Education, and QS rankings for American schools. Why not UIUC? UIUC clearly has an excellent computer science department with world-leading research and recruitment by the hottest tech companies. It is without doubt an academic powerhouse. However, its graduates’ employment outcomes aren’t as good as some private colleges’ and several of of its state-school peers’. This may be affected by its Midwestern U.S. location, away from big tech hubs. The University of Waterloo reports just over 3,000 enrolled students. Assuming the University has graduated 3,000 students 2013-2016, this yields a Relative Employment score of .41, around the same as Washington State University and Rutgers University (and slightly higher than MIT!). Please contact us below if you can provide statistics on the number of computer science degrees awarded by Canadian schools. Our search parameters are for mostly American companies, so it makes sense that a large proportion of the overall results indicate employment in the United States. Waterloo, UBC, McGill, and Queen’s University all had the majority of their search in the United States. Schools report various degrees awarded, including several in the “Computer and Information Sciences” category, including computer science, data science, and computer programming. For our rankings, we used the most widely reported category, “Computer and Information Sciences and Support Services” as well as “Computer Engineering.” For schools that reported degrees in categories other than “Computer Science” and “Computer Programming” (e.g. “Information Science, Computer Networking”), we subtracted the non-coding degrees. In our initial analysis, we included schools that awarded at least five “Computer and Information Sciences and Related” degrees in 2017. We used data from 2013-2016 inclusive. Our final ranking includes schools that awarded at least 40 computer science or computer engineering degrees in that time period (an average of 10 per year). Graduation year: We limited search results to include candidates who finished school between 2012 and 2017 inclusive. This was to minimize the effects of industry experience on job placement and bias results toward early career placement. One limitation is that LinkedIn does not allow for differentiation between college and graduate school. However, we believe that the quality of program will be largely consistent between graduate and undergraduate. 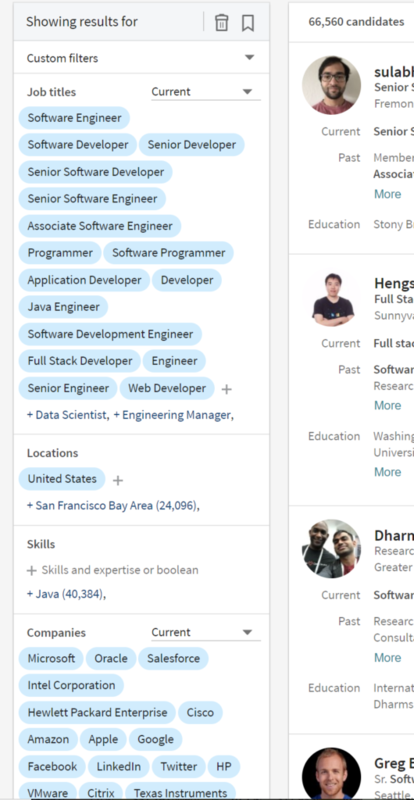 Position: Software Engineer; Software Developer; Senior Developer; Senior Software Developer; Senior Software Engineer; Associate Software Engineer; Programmer; Software Programmer; Application Developer; Developer; Java Engineer; Software Development Engineer; Full Stack Developer; Engineer; and Senior Engineer Web Developer. Although this list may not be exhaustive, it most likely would not include those in sales, marketing, human resources, and non-software management positions. Companies: Adobe; Airbnb; Amazon; Apple; Arista; Bloomberg; Brocade; Cisco; Citrix; Dropbox; eBay; Expedia; Facebook; Google; HP; IBM; Intel; Intuit; Juniper Networks; KLA-Tencor; LinkedIn; Microsoft: NVIDIA; Oracle; PayPal; Qualcomm; Salesforce; Symantec; Texas Instruments. These were derived from various “best companies to work for” and “software companies with highest starting salary” lists. We purposely did not include consulting companies such as Accenture and large outsourcing companies such as InfoSys. We used data scraped from PayScale’s website and directly from U.S. News Compass™. Where there were differences between the figures, we used the higher of the two. For all schools reporting computer engineering degrees, we used reported data to calculate a weighted average of the median starting computer science and computer engineering salaries. PayScale reports a median starting salary for “computer and information sciences” at MIT of $95,700 and a median starting salary for “computer engineering” of $102,300. Because the primary computer science degree at MIT is “computer science and engineering,” we used the higher figure unweighted. 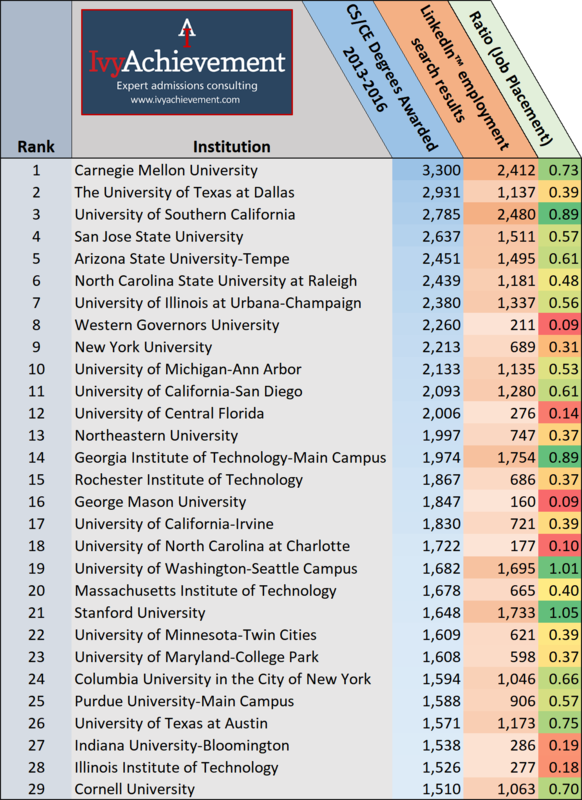 Using the lower figure, MIT’s rank would be #17 (just behind Columbia) rather than #12. 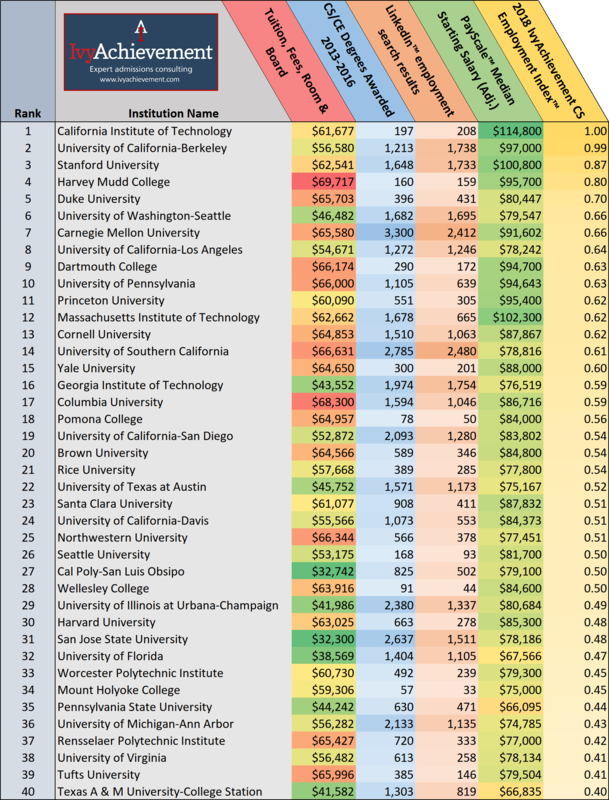 Dartmouth does not offer computer engineering as a major, but PayScale reports a median starting salary of $81,800 nonetheless. For our computer science rankings, we used the “computer science” figure unweighted. Using the lower figure, Dartmouth would be #21 (just behind Brown) rather than #9.